President Nicolás Maduro announced last week the creation of the Local Committees for Supply and Production (CLAP), groups of Socialist Party members who will be in charge of controlling food supplies, preventing black market sales, and door to door distributions of food. Maduro has called these groups the “great instrument of the Revolution to win the economic war,” Argentine news outlet Infobae notes. 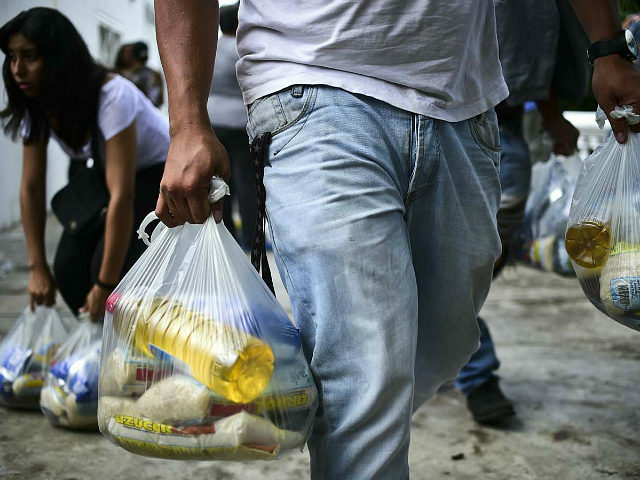 Venezuelans are currently forced to buy food through a rations system that forces them to stand on supermarket lines up to eight hours long. Often citizens find out — after they have made their way through the lines — that the supermarket in question has run out of basic goods like rice, vegetable oil, and milk. Distributing bags of food door to door, the government hopes, will diminish the length of these lines. The bags are meant to last 21 days, according to the government but carry only 3 kilos of rice, a kilo each of sugar and milk, a bag of beans and a liter of oil. Thus, in addition to distributing food as they see fit, the CLAPs are responsible for keeping track of all food in any given area and for ensuring no one the government has not authorized receives food. Controlling food supplies has become increasingly important to the Venezuelan government as riots become more and more common. Last week, in the heart of Caracas, hungry patrons of a local market rioted after seeing a shipment of rice enter the market and almost immediately being told the food had been redistributed to the Bolivarian National Guard (GNB), the troops typically responsible for attacking peaceful anti-government protests. Chanting “we want food,” a crowd of hundreds began to march towards the presidential palace, halted only by the GNB using tear gas and violent Chavista gangs known as “colectivos” attacking both protesters and journalists. Experts have expressed concern that placing the nation’s food supply at the mercy of Socialist Party loyalists can result in the starvation of anti-socialist activists or even those who prefer to abstain from political activity. “Excluding a social faction with something as delicate as acquiring food could even take on genocidal characteristics,” Venezuelan professor Magally Huggins said of the plan to have one party control all food. “It is a food apartheid,” she added. Adding to concerns regarding the CLAP groups is the fact that they do not appear to have done much to shorten supermarket lines.